Holding a cat in your arms has to be one of my most favorite things, but oddly it's only been in the last 10 years that I have been able to do this. I used to be too nervous and scared that the cat would turn around and bite or scratch me. In fact this was quite possible as I used to hold cats completely wrong and this would cause them to struggle and slip out of my arms. Why Is It Important To Pick Up And Hold A Cat Correctly? Cats are very independent animals and in general they like to be free to do what they want when they want. Being held is not a natural situation for them and if this is done in such as way whereas they feel insecure or nervous then it it's likely that they could lash out and bite. If a cat is picked up incorrectly too often then it will become harder and harder in the future to have this sort of relationship with your cat. They will become instantly afraid every time you try to hold them and this will result in a cat who wriggles to get free from the start. It is important that cats do become used to being handled in this way as there will be occasions where it is essential for you or a vet to either put them in a carrier or hold them for examination. Approach your cat slowly, sudden movements will settle them. Talk softly to your cat to gain their confidence. Bend at the knees and stroke your cat a few times. Place one hand under your cat's chest near to the fore legs and at the same time scoop up their behind up with your other hand. 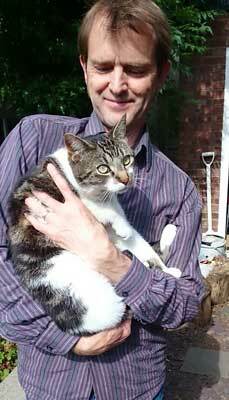 Bring the cat up to your chest height and bring them into you so that you can then hold them securely. It is important that when holding a cat you should make sure that you hold your cat fairly tightly against you. This will help to reassure the cat and they will feel secure. Make sure that you continue to support the rear end. Do not let legs dangle and this can be painful and will make your cat feel insecure. Some cats may even allow you to hold them in a baby position on their back. Although this is less common as most cats find this position too venerable for them. Cats do not like to be held for too long, this is natural and you should watch out for signs that they are ready to be placed on the floor. Never just let go of your cat, always bend your knees and lower them to the ground gently. 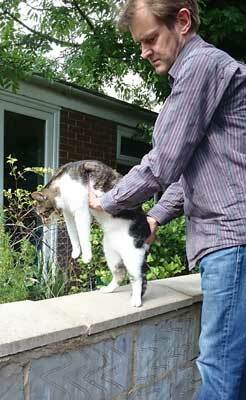 This will also reinforce the cat's perception of being picked up as a good and pleasant thing. Cats can be frightened or weary of children. This is because they can be unpredictable, make sudden movements, or make loud sounds. Small children can also pull tails, fur and ears and this is not something any cats wants. So it is important to give children in the family a lesson on how to stroke, approach and if necessary how holding a cat should be done correctly. Very small children should be discouraged from holding and cuddling cats as this can cause injury to either the child or the kitten. If accidents happen then the danger is that a long term fear can be instilled in either the cat or the child of this experience. Most pet cats will be used to some handling and so taking them to the vets and being examined should not be too much of a problem. However there are some situations where it will be necessary to restrain a cat so that they are unable to move and lash out. Some cats simply never learn to like being handled. Some pet cats I know who are the most loving and gentle at home turn into a monster when they have to go to the vets. Your vet may ask you to help hold your cat during an examination. The best way to do this is with your cat laying front ways on the table. From behind the cat rest your arms either side of their body with your hands pressing gently but firmly on their front legs. This will stop your cat moving the front of their body or running away. From the side place both hands on your cats back between their shoulders and press gently but firmly. Make sure the cat is unable to turn their head and bite you. Hold firmly the scruff of the cats back neck and the front or back legs depending on the area to be examined. This may look rather nasty or rough from an outsider's point of view but the scruff of the neck when tightly held does not hurt the cat but makes them subdued. The mother cat picks up her kittens in the same way. Another method is to wrap your cat in a towel so that they are unable to move. This is less helpful for a vet as he cannot get to the body to examine but is helpful when administering tablets or eye drops. Stray cats or feral cats should not be handled unless it is by a trained professional. Serious injury can be caused to either human or cat. I hope you have found these tips helpful. I have seen all of these methods used at one time or another and have seen positive results in all cases.